Before I traveled to the Dominican Republic through the FIMRC Health Fellowship, I was expecting that my experience would be filled with eye opening medical experiences and fascinating patient cases. I mean, I am a medical student after all, so it was understandable that that was my initial focus and I anticipated that to be my biggest take away. I was absolutely right in the fact that I did see and experience all those things and that was a wonderful part of my experience. However, I was wrong that it would be my biggest take away. The thing that I learned about most while in the Dominican Republic was about the importance of community. Don’t get me wrong, my time spent in the Dominican Republic consisted of many hours in the local hospital and UNAP (which is an out-patient clinic funded by the government). I saw many patients who came in with infectious diseases like scabies, impetigo, and cellulitis- all things that would interest any student in medicine. I have spent the last 2 year buried in medical text books studying all of these diseases, so it was a surreal experience to see real patients come in with manifestations of things I have only seen in textbooks. Primary care physicians truly lived up to their “jack of all trades” nature and treated variety of illnesses that would otherwise be treated by specialists in other areas with more resources. I learned so much about what health care looks like in not only a 3rd world country, but in a rural area. I can say without a doubt that the lens that I once used to view healthcare with has forever changed, and I am better for that. However, when I think back on my trip, and especially when I try to answer the frequently prompted statement of “tell me about your trip!” I realize that the first word that comes to my mind is community. One of my biggest attractions to traveling with FIMRC was the fact that they set you with a homestay as your form of housing. This really appealed to me because I not only wanted to work on my Spanish, I wanted the “full experience” which I believe I could have if I stayed with a local family. Of course, I was a little nervous to essentially move into someone else’s house for one month. However, as the van transporting us from the airport pulled up to the street of my homestay house in Restauración, those nerves instantly vanished as I saw my homestay family standing on the porch with big waves and smile. Within the first 10 minutes of walking into my new home for the next month, I was in the backyard de-scaling fish on a wooden stump to help prepare dinner for the family. I felt instantly at home. As the weeks went on, my favorite part of the day was coming home and helping Nena, the mother of the household, prepare dinner every night. Since the electricity in the town isn’t reliable and goes in and out, perishable food is not kept in the refrigerator and dinner is to be made every night. Nena and I would go out to the local Colmados (similar to a small convenience store) and collect things like rice, eggs, vegetables, and cheese that would be used for that night’s meal. “Puedo ayudarte” (which interprets to “can I help you?”) became my go-to line and entryway to many activities that I otherwise wouldn’t have experienced. Partaking in these sort of activities by no means are a requirement through FIMRC and most of the other students didn’t cook and do “chores” with their families. But for me, it was the time where I felt I could bond with the family the most and truly experience what it is like to live in Restauración. I learned to cook traditional Dominican meals and doing so with one tiny wooden cutting board, one knife, sometimes running water, and a gas stove. I also learned how to do this while fully covered, to hide from the mosquitos, yet dripping wet because of the relentless Dominican heat. It was quite the experience, one that I would never trade. Now if you are reading this and wondering why my entire blog seems to revolve around cooking and dinner time, it is because not only do I love to cook and eat, but also because this is when the sense of community in Restauración really came through for me. Once dinner was made, everyone and anyone was welcome to it. A separate plate was prepared for Abuela who lived down the street and was taken to her for all the nights she didn’t join us. There was someone new at the dinner table every night whether they were family, friends, or just hungry children that were playing in the street in front of the house. This was a new kind of experience for me. Where I live, in order to share a meal with my extended family or friends, meals have to be planned and scheduled to a great extent. At my host home, friends and family would stop by simply to say hello and check in. There was a true open door policy in Restauración and I quickly learned the deeper meaning of community. During the four weeks I was there, I came across a boy sitting on the sidewalk who had an infected laceration on his face. After tracking him down, finding his family, and taking him to the hospital for some stitches, he was prescribed a 14 day course of antibiotics. His antibiotics needed to be refrigerated and given twice a day. His family did not have a refrigerator. His medications were kept at my host family’s house and we would make sure that one of us (either me or my host mom) would give him his medication twice a day, understanding the importance of taking every dose. This was no small feat. Schedules were busy and we could not always find him, so many a times the children that lived by him would go run around the town screaming his name, eventually bringing him to us. The saying “it takes a village” has never had so much meaning for me. Ensuring that he finished his course of antibiotics properly truly took a village, the help of an entire community. It’s experiences like these that really made me understand a word that is used so often. Community. What does that mean to me? What does that not only look like, but what does that feel like? How important is it to me that I am part of a community? These are questions that I would have never taken the time to really reflect on if I had not gone to the Dominican Republic through FIMRC this past summer. I learned that a community takes care of each other in all things big and small. Whether that be rationing a meal out to share with a neighbor or taking someone else’s child to the hospital because they need help; that’s what it is like to be part of a community. Being part of a community means that even if the front door isn’t physically open, it is always metaphorically open. There is a pride that accompanies being part of a community. “Somos Restauración” spray painted by the local river means something. I hope that I too am part of a strong community one day. I have learned that this is important to me and something that I will make a strong effort to seek out, especially in the somewhat individualistic society we live in. I thank FIMRC for the opportunity to experience this, but I would most like to thank the people of Restauración for allowing me to be part of their community for my time there. Thank you. 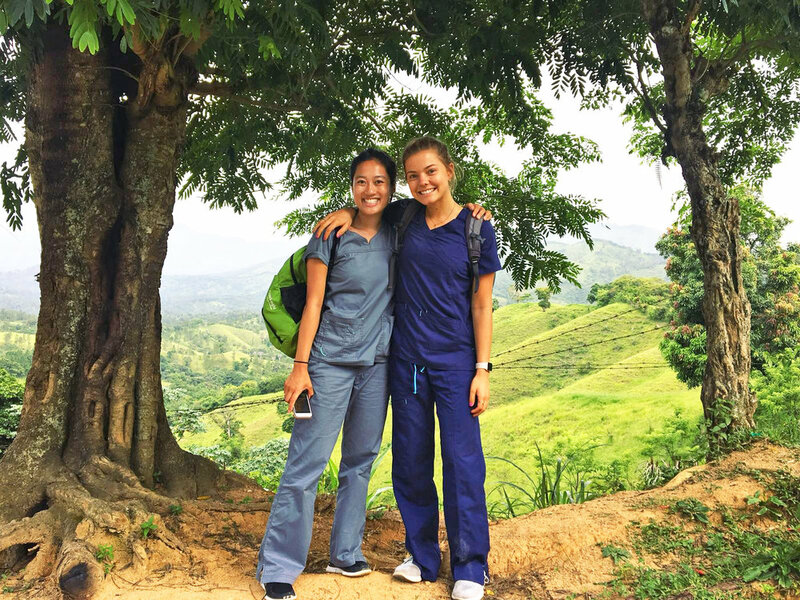 Opportunities to serve communities in the DR and elsewhere are available year-round. Start planning your own service trip today!